Some believe in the “Thucydides Trap": the idea that, since a rising power will challenge the dominance of an established one, a China-U.S. trade war will be inevitable. Being the largest and the second largest trading nations globally, the U.S. and China are in fact each other's most important trading partners, among many aspects of their complex interrelationships. 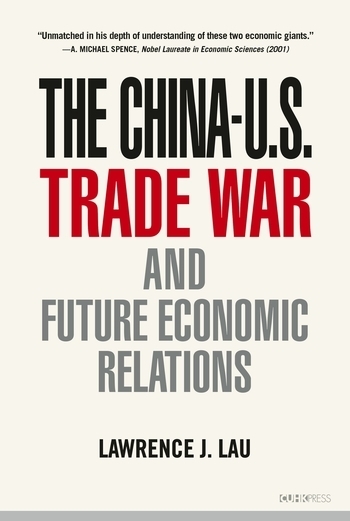 In this book, Lawrence J. Lau examines various economic statistics of the past few decades to show that while the real effects of the China-U.S. trade war in 2018 are not negligible, they are relatively manageable for both nations. There is no need to panic, despite psychological effects on the Chinese stock markets and on the renminbi exchange rate. Behind the trade war is the potential economic and technological competition between China and the U.S., which is likely to become the “new normal." It is up to each government to battle against the rise of xenophobia, based on the fact that China-U.S. economic collaboration is a potentially positive-sum game through better coordination and fully utilizing each other's currently underutilized resources. Balancing China-U.S. trade and enhancing economic interdependence are not only possible, but desirable. Lawrence J. Lau is Kwoh-Ting Li Professor in Economic Development Emeritus at Stanford University and Ralph and Claire Landau Professor of Economics at The Chinese University of Hong Kong.